How to restore Bluetooth icon in the taskbar (system tray) on Windows 7? I removed it by a mistake. 1. 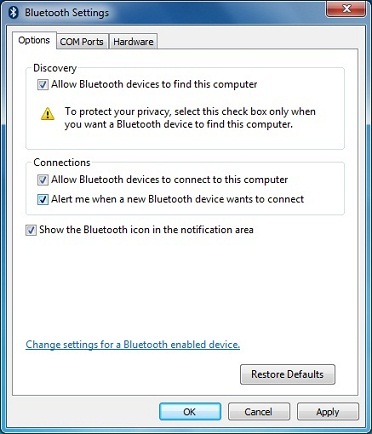 Right-click on th Bluetooth icon in the taskbar (system tray) and select the "Remove Icon" command. You will see the Bluetooth icon removed from the taskbar. 2. Click the Windows "Start" button. 3. Type in "Change Bluetooth Settings" in the Search field and press the "Enter" key. You will see the "Bluetooth Settings" window showing up. 5. Click "OK" to save the change. You will see the Bluetooth icon showing up again in the taskbar.